Which of the Following Do You Plan to Implement in 2019? 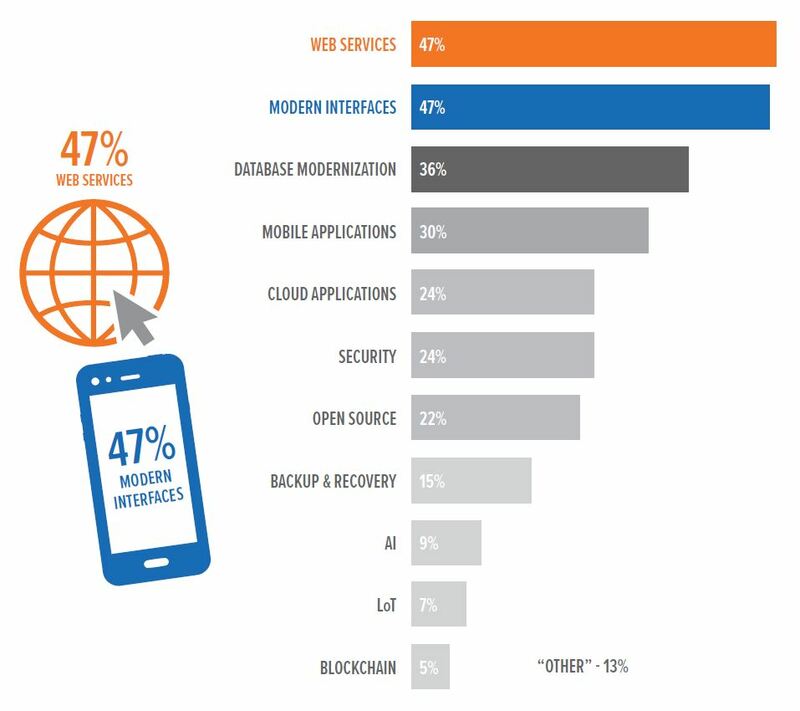 When asked about their development plans in 2019, almost half the respondents said that web services and modern interfaces were in their near future plans. We have seen interest increase in all categories except for modern interfaces and mobile applications. We believe that most IBM i businesses that were interested in those categories have already modernized their GUI and mobile efforts and are now focused on other areas like open source development (up 6% from last year). We also asked respondents to give their plans for IoT, AI, and Blockchain development. Even though their responses made up a small percentage... it shows that IBM i businesses are beginning to consider adopting these new technologies. What Will Your Team Look Like in the Next Year? Not much has changed since last year's results in this category. 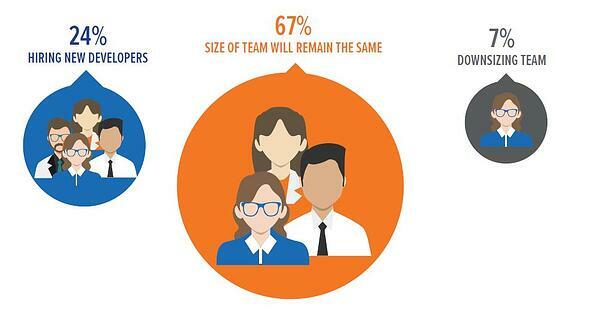 The slight change is a positive one though, most respondents stated that they plan to have their development team stay the same size compared to last year and more companies (up 3%) will hire additional developers in 2019. Compared to last year, fewer businesses plan on downsizing due to the retirement of their developers. Do You Plan on Modernizing This Year? The number of respondents who are definitive about their modernization plans in 2019 has increased over the past year with only 33% weighting in that they were unsure. Those dedicated to modernization in 2019 has increased by 3% since last year while those who have no plans for modernization is down by 5% since 2018. This shows that there is a healthy growth towards modernization in the IBM i community and we believe we will see those numbers continue to climb. Which Modernization Projects are You Starting? 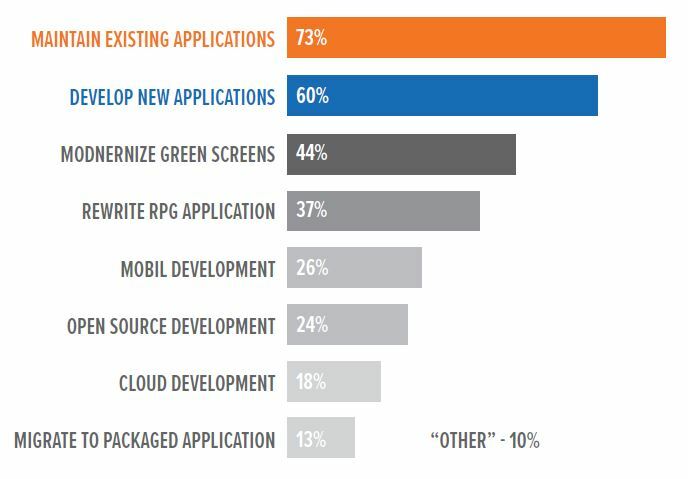 When it comes to the different modernization projects available to an IBM i business, modernizing green screens to rich GUI interfaces and fixed-format RPGLE continue to be at the top. A small percentage of people still believe that migrating off the platform is their future, but that number still remains low. The biggest increase in modernization projects comes from open source development which increased by 20% since last year. This shows there is a significant interest in new and helpful technologies. What's Holding You Back From Modernizing Your IBM i? Similar to last year, cost remands the biggest hurdle for modernization projects. But management objection has actually decreased by 5% over the last year. This is a great sign that management continues to come around as champions for modernization. 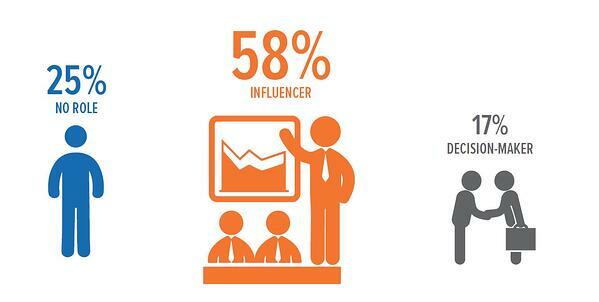 Over 25% of respondents said that they had already modernized their system. 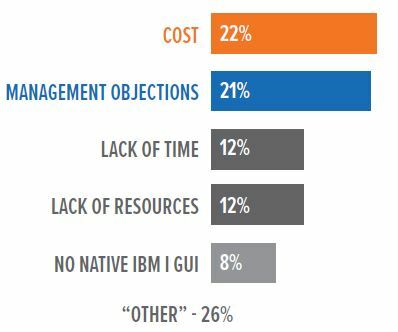 The "Other" category outpaced all the objections listed so it is difficult to truly grasp what is holding developers back from being able to modernize their IBM i. How Would a Modern Environment Help? The response to this question has stayed consistent year over year: Modernizing IBM i applications, code, and databases have a wide variety of positive impacts on a business. What Are Your Development Plans for IBM i in 2019? Modernizing green screens has slightly dropped when compared to last year's results. For the most part, the pace at which businesses are developing new applications has not changed a great deal. Newer capabilities (open source, cloud development, etc.) have increased in importance. Mobile development is missing the urgency we have seen in previous surveys, coming in 5% less than last year. What Are Your Reasons for Modernizing? A businesses' need to add modern web GUIs to IBM i applications still remains the top reason for modernizing. Similar to last year, staying competitive in their market comes in at number two. The largest swing is the need to create mobile apps which have seen a drop in 10% since last year's survey. Overall 38% of respondents felt that they will achieve great things on their IBM i platform this year and years beyond. We have seen a significant increase in the positive outlook for the future of the IBM i and we couldn't be happier. Less than 10% of people don't see a future with the IBM i while more than 70% see a bright future. This indicates the stability and the sustainability of IBM i is strong this year and beyond. 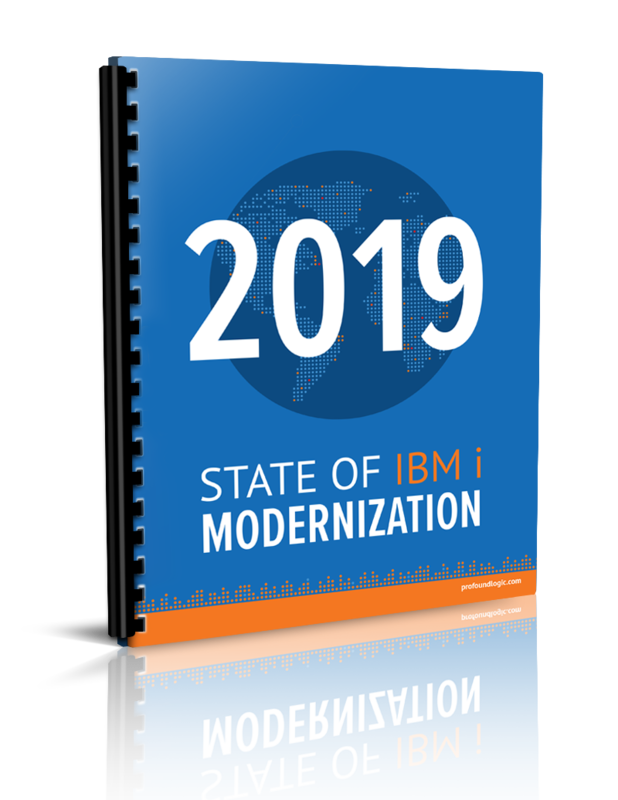 The goal of the State of IBM i Modernization survey was to asses the current attitude towards the IBM i platform and determine the current/future plans for modernization. Here are some details of the participants in the survey. What Size is Your Organization? What is Your Role for Purchasing New Software/Hardware? Profound Logic's mission is to provide the most innovative and native solutions for IBM i application development and modernization. For 20 years, we have transformed thousands of legacy interfaces, developed modern desktop and mobile applications, and optimize enterprise systems. Our developers are true IBM i experts and fluent in modern languages that include RPG, PHP, HTML5, and Node.js. ...and get The 2019 State of IBM i Modernization White Paper FREE!